Note: This is an archived publication! Visit www.e-benchmarksstudy.com for the most recent versions of all our Benchmarks studies and Benchmarks Extras. Looking for more information about our storytelling webinar? Click here. Working on our 2011 eNonprofit Benchmarks Study, we noticed something interesting when looking at year-over-year data by sector: The share of online revenue from monthly giving for International groups seemed to decline from 2009 to 2010. We theorized that while both one-time and monthly giving increased from 2009 to 2010, one-time giving for International groups grew at a much higher rate, likely due to the high number of international emergencies in 2010. We decided to do some deeper digging to see if we were right! If you look at the chart on page 15 of the 2011 eNonprofit Benchmarks Study, you can see that the International sector saw huge growth in online revenue from 2009 to 2010 while other nonprofits saw much slower growth. For this Benchmarks Extra, we separated the data for one-time giving and monthly giving. When we did this, we found one very big takeaway: Monthly giving is increasing in importance across the board! While monthly giving is growing, the change in one-time dollars raised online year-over-year is much more erratic. For the International sector, one-time dollars raised online increased by 192% from 2009 to 2010, as a result of a huge influx of giving during emergencies. While monthly giving increased at a much lower rate from 2009 to 2010, take a look at the change in one-time and monthly giving from 2008 to 2009: though one-time giving sharply decreased in accordance with the tough economic times, monthly giving continued to grow! These dependable monthly supporters generate stable revenue for organizations, proving these programs to be incredibly valuable – especially in tough times. We also found monthly giving to remain reliable when it comes to average gift size, even as organizations continue to grow their programs. The International sector’s average one-time gift consistently declined through times of both increased and decreased fundraising. 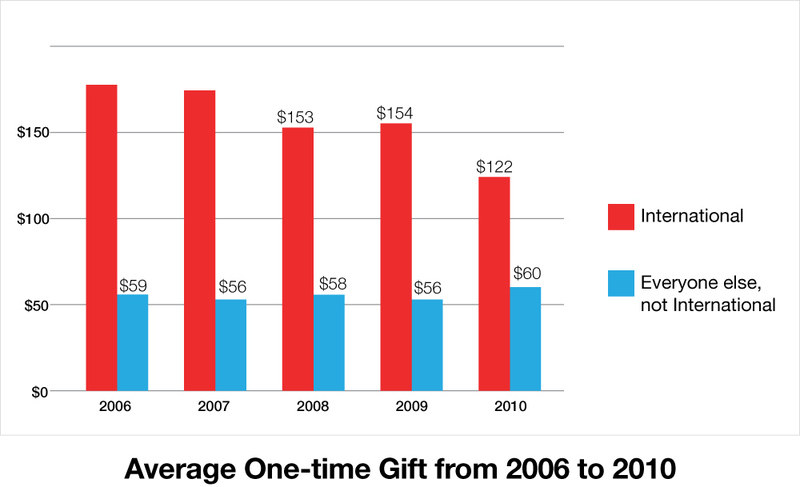 The disasters of 2010 brought in more one-time donations, but those donors made significantly smaller gifts than donors making mission-based donations. This contrasts with the average monthly gift, which held steady for the International sector and slightly increased for everyone else. This again shows the value of monthly donors as a stable source of income, with an average gift that is less dependent on the news of the day. If you have questions about Benchmarks Extras – or the data in this year’s Benchmarks study – please don’t hesitate to get in touch with us.